Today felt good or as good as it can feel once your body gets used to doing 2.5 hour long training runs, 4 hour bike rides, regular 3+ hour training sessions, weekly power bike interval training, training 2x a day which includes swimming, and let’s not forget life. Today's long run. Doing the work. 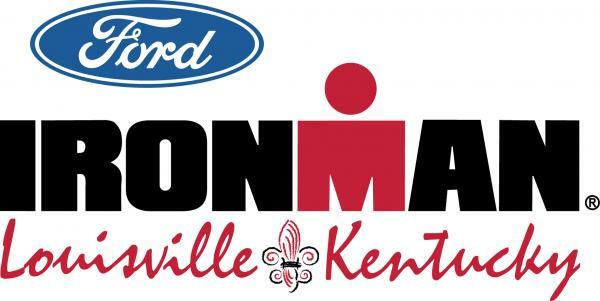 We are 11 weeks out from my first Ironman (2.5 mile swim, 112 mile bike, and 26.2 run consecutively) and my husbands 3rd. One of the things that I have to constantly search and connect to is my motivation. I believe motivation is that deep meaning/energy that keeps you hungry in life and sport. It keeps you striving, amped, energized, and reminds you that you are always reaching for greatness. I keep my motivation tank fueled in various ways. Many of you already see reflected in my blog…videos, quotes, pictures, my blog itself helps to me document my accomplishments. 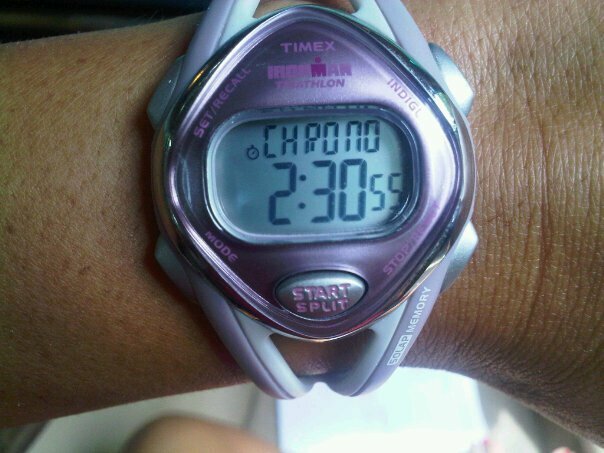 Because ironman training is so life and time consuming I like to have my “motivation tools” visible because it reminds me to stay focused. 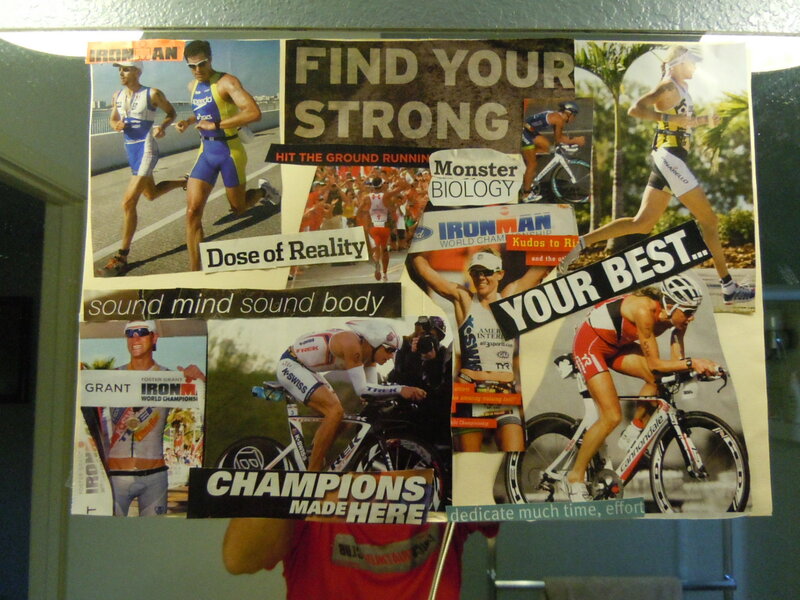 One tool that I encourage everyone to use is a motivation board. My husband and I made these one rainy day a couple of weeks ago when we were feeling discouraged about the weather. 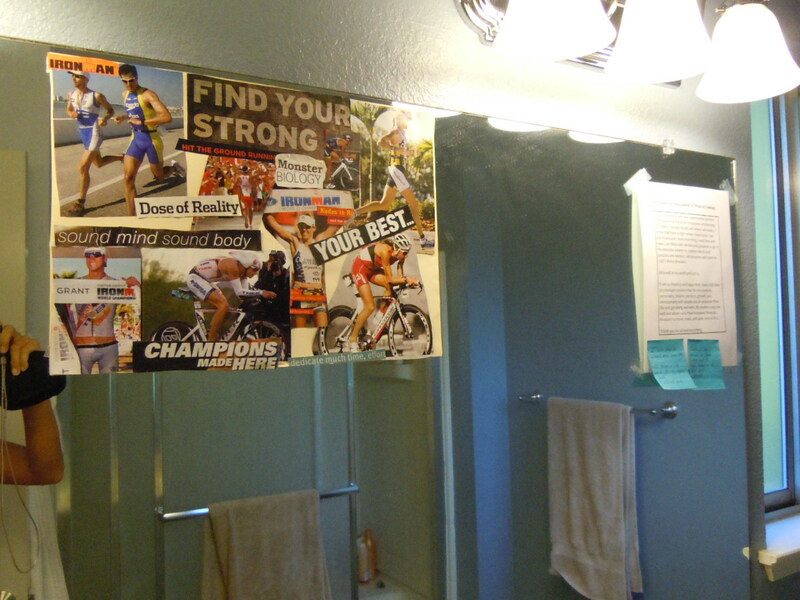 They consisted of various motivating pictures and power words, cut out from our triathlon and running magazines, that capture what we see as motivating. 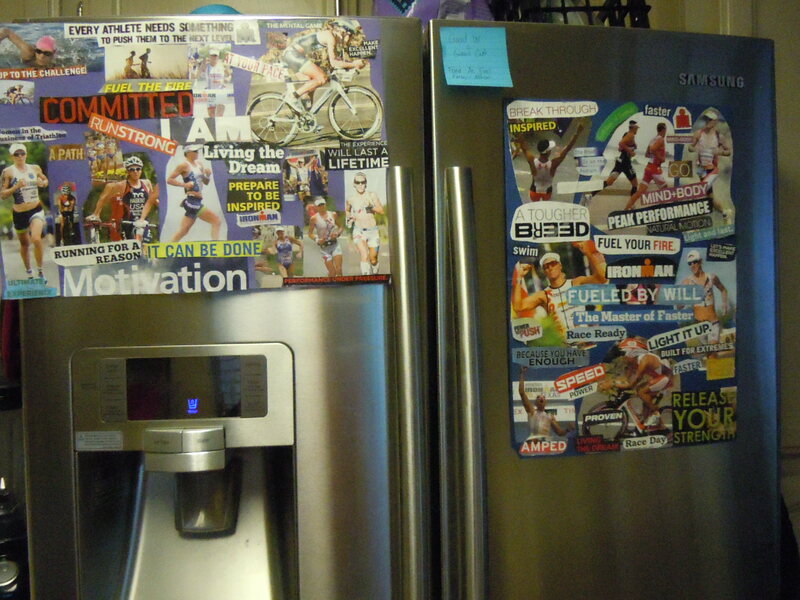 We each made one and then made one together and have one posted in the bathroom and the others on our kitchen refrigerator, as you can see we also have type affirmations posted too. I believe this helps keep us focused, energized, and fueled with motivation. Team K & G Motivated! Also I love watching motivating videos that are intense, motivating, or show athletes performing in a way that I would like to see myself performing, especially the night before a long run or a hard training session. Here is an AWESOME video that always gets me excited. I will be an Iron(wo)man. See you in August KY. Previous Previous post: Keep Doing The Work.